Branford Soccer offers only Online Registration. During the signup period, you will see a "Register Online" button on the left menu bar. Go there to sign up one or more players securely using Visa or MasterCard. Start on the home page by clicking the “BSC Teams” tab at the top. On the next page, use the drop-down menus to find the correct season, the correct Age Group for your child (e.g. “Micros” or “U-12 Girls”), and then on the right side drop-down list, find the specific team. Once there, you can click on “Schedule” on the left navigation bar to find your team’s schedule for the season. Click the + sign next to each game to see more information, including directions to the field, whether it’s a game in Branford or out of town. Printable directions to out-of-town fields are additionally available from the home page by clicking the “Area Fields” button on the left nav bar. And please, if you find any of these directions contain errors, let us know by clicking the “Feedback” button on the home page. We’ll fix it. Or we’ll move the field so it matches the directions. Individual team pages also have contact information for every team’s coach, while on the home page, the “Contacts” button on the left nav bar tells you how to get in touch – by phone or email -- with Branford Soccer Club board members, coordinators, coaches, and others. Most of the ways you can volunteer to help the Branford Soccer Club, and your child, do not require any soccer knowledge. It's true. So there are no excuses. Well at least not that one. Please go to our Volunteer! page to learn how you can help. It’s raining. It's cold. Do I really have to drive all the way to Oxford? To find out, check the site’s home page. The scrolling message across the top will let you know -- as soon as it possible to know -- if local fields are closed or if travel games have been cancelled. Please understand that it may not be possible to know if games are on or off until an hour before game time. This is frustrating for parents, coaches, and the club alike. Honest. 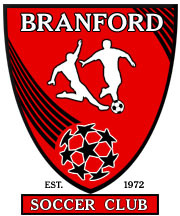 www.BranfordSoccer.org is the place to go to find out everything from tryout schedules to board meetings to game results. If we're in tournaments, if we're running special programs, contests or clinics – whatever the club is doing -- we’ll try to post it here as early as we can. Coaches (and parents and players) can click on the "Skills and Drills" tab at the top of the site to learn where they can print out drills and entire practce plans for their teams. Little may you realize how important sponsors are to your child's soccer experience. Companies and individuals that sponsor BSC teams make it possible for the club to keep the fields and equipment in shape, run seminars for coaches, and hire professional soccer trainers to come in each week and teach your young players. If you’re a parent, please support them by clicking the “Our Sponsors” page and giving them your business. If you’re an area businessperson, please consider becoming a BSC sponsor, for which, among other things, you’ll get an ad on the BSC web site and, hopefully, the custom of some grateful parents. Clicking the "Lost & Found" link on the right-hand side of the home page takes you to an area where you can post items you want to swap, items you're looking for, or things you've lost or found at one of the fields. Got a pair of size 4 cleats your child has grown out of? Found a soccer ball belonging to a "Kevin," or possibly "Keiran"? This is the place to post what you've found, or what you want or need. If you have questions, comments, suggestions or, well, “issues” about anything regarding the Branford Soccer Club, please let us know by clicking the “Feedback” tab on the home page. Thanks, and have a great season. ps -- If you’ve gotten this far, you now know more about this site than we do.